WARSAW — A Warsaw man who is already incarcerated in the Kosciusko County Jail, and who has a history of violence toward police officers, was sentenced to additional jail time in connection to more violence and drug incidents from inside the jail. 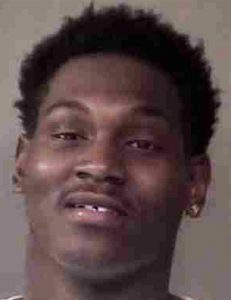 Rydeem Othello Hudson, 21, 404 N. Parker St., Warsaw, was charged with two counts of battery resulting in bodily injury to a public safety official, level 5 felonies; three counts of battery by bodily waste, level 6 felonies; two counts of resisting law enforcement, level 6 felonies, one count of intimidation, a level 6 felony, one count of dealing methamphetamine, a level 5 felony; and one count of trafficking with an inmate, a level 5 felony. Hudson pleaded guilty on June 18 to one of the battery charges involving police, one of the battery by bodily waste charges, one of the resisting law enforcement charge, the intimidation charge and the trafficking with an inmate charge. Hudson’s attorney and county prosecutors agreed that all other charges would be dropped in exchange for the guilty plea. On Jan. 5, a nurse at the jail discovered a plant-like material, believed to be a synthetic, look-alike drug, along with a quantity of methamphetamine, inside a bottle of lotion that had been delivered from outside the jail to Hudson. Hudson, according to police records, was recorded talking to people on the outside about having the drugs delivered to the jail. On April 4, Hudson was advised by jail officials to comply with jail rules in terms of talking to other inmates. A corrections officer advised Hudson to move away from a door on several occasions, to which Hudson told the officer to watch out or he would be harmed like one of his fellow officers had been in a separate incident. Hudson also told the officer to enter his cell block and that if he did, he would be (messed) up. Three officers entered the cell block in order to restrain Hudson and move him to a holding cell. Police say Hudson then shouted threats of killing the officers and resisted, causing injury to several of the officers and spitting on all three of them, hitting them with spit on the face and in the mouth. Hudson appeared to be smiling during his Monday, July 9, sentencing hearing as he received an eight-year sentence with six years to serve, due to several of the sentences scheduled to be served at the same time, or concurrently. “Mr. Hudson has pleaded guilty and has expressed a desire to take responsibility for his actions, said Doug Lemon, Hudson’s attorney. “That’s somewhat refreshing,” Lemon continued.